Akbar Ali Khan (born 1944) studied History in Dhaka University and Economics in Queens University, Canada (MA and PhD). Dr. Khan had been a career civil servant since 1967, actively participated in the Liberation War of Bangladesh in 1971 and was sentenced in absentia by military rules to fourteen years rigorous imprisonment. He served in highest positions in the Government for about ten years and retired as Cabinet Secretary. He also held the position of Alternate Executive Director in World Bank. After retirement, he established the Center for Governance Studies in BRAC University as its fist Director. He was an Advisor in the Caretaker Government (2006-07) and subsequently resigned. 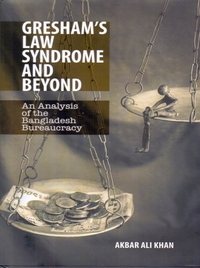 Khan has several publications and a number of research articles on governance, economics, water resources, rural development and history of Bangladesh in national and international academic journals. He was awarded the Justice Mohammad Ibrahim Gold Medal for his book ‘Discovery of Bangladesh: Explorations into Dynamics of a Hidden Nation (Dhaka; UPL, 1996) in 1996-98. his book ‘Pararthoparatar Arthaniti’ (Economics of Altruism) (Dhaka: UPL, 2000) was widely acclaimed as a significant contribution to economics in Bengali. Dr. Khan was awarded Honorary Fellowship by Bangla Academy for his contribution to economics.